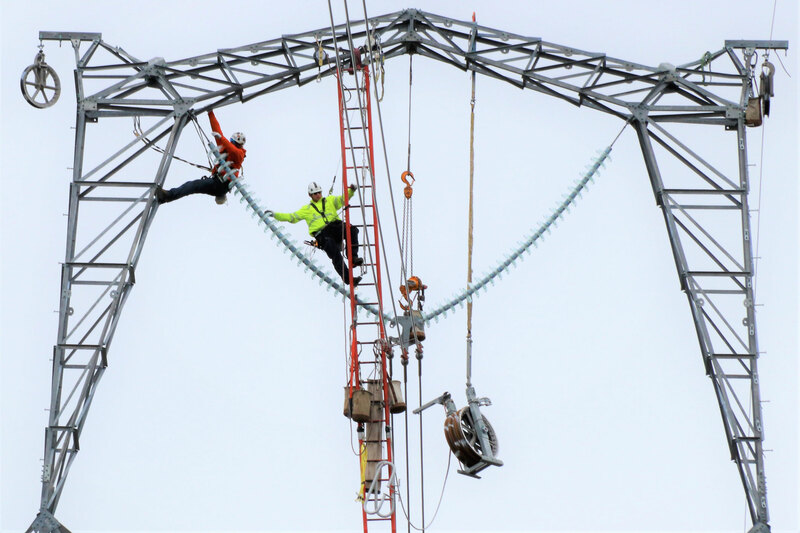 Wilson Construction Company has immediate job openings for linemen on the Great Northern Transmission Line 500kV project located in northern Minnesota. Our fresh, flexible solutions, complete design/build services, and personalized approach bring quality results and client satisfaction. Wouldn't you like to have peace of mind on your next project? Are you interested in receiving more information about our company? Or would you like to discuss specific project needs? We would be happy to assist you. Please feel free to request a Statement of Qualifications or a personal follow-up to address your project plans. We look forward to working with you. We have both new and ongoing opportunities for quality subcontractors and suppliers from coast to coast. Wilson encourages small business participation, which includes M/W/DBVE sources to meet the diverse business participation goals of federal, state and local jurisdictions. From small to large businesses, our emphasis on client satisfaction and fast-track performance offers promising opportunities for our subcontractors and suppliers who are ready to meet the challenge with exceptional performance. Wilson Construction Company is an equal opportunity contractor and employer. Join our team! We are an equal opportunity IBEW employer and are always interested in adding outstanding individuals to our staff of highly qualified personnel including: project managers, superintendents, technical and office support. Competitive pay, attractive benefit packages, and a dynamic team approach throughout our organization makes Wilson Construction one of the most rewarding career options in the industry. Wilson Construction Company is a well established, privately-owned electrical utility construction company in business for over 65 years. We are proud to be named one of Oregon Business Magazine's 100 Best Companies to work for. Wilson Construction Co. is seeking an IT Systems Administrator to assist in handling the day to day IT functions and administering SharePoint at our headquarter office under the supervision of the IT Director. This position has a multitude of duties and responsibilities for a well-rounded IT Systems Administrator. · Provide regular and ongoing training to users in both large and small groups, and individualized training as necessary for new or modified equipment and software. · Candidates must reside within a reasonable driving distance from the office or be willing to relocate. · Must be able to pass a drug screen, background and reference check. Wilson Construction Co. has an immediate opening for a Safety and Work Practice Coordinator based in Rancho Cordova, CA with a positive, can-do attitude. The Safety and Work Practice Coordinator will be responsible for worksite analysis, hazard recognition, employee involvement (e.g., duties of crew members, foreman and general foreman), hazard prevention and control, and compliance with customer specifications and Wilson construction methods. The Safety and Work Practice Coordinator will perform safety audits using the iAuditor app and work practice observation form to document observation findings. · Review with the crew portions of the Project Specific Safety Plan (PSSP) that are relevant for the planned tasks of the day. · Audit the Task Hazard Analysis (THA) forms to assure they are complete and consistent with the PSSP. · Participate in the daily tailboard with the crew at the show-up yard and during the on-site THA process. Emphasize the critical importance of identifying what could go wrong and the necessary precautions to prevent those hazards from happening. During higher risk tasks, ensure that detailed discussions and monitoring by the general foreman happen more frequently. · Invite customer field representatives to meaningfully participate at the morning meetings. · Seek constructive feedback from customer field representatives at least twice per week, if not daily. · Assure the general foreman meets with each foreman in the morning to discuss the daily work plan and identify foreseeable hazards. · Provide management with feedback on whether all crew members are meaningfully participating in preparing the THA. Evaluate crew culture and whether they actively engage with Human Performance principles and tools. · Interview every new crew member to understand the nature and extent of the new worker’s experience and to ensure the new worker is fit for duty to perform tasks safely and properly. · Provide immediate feedback on work practices. Compliment crew members when things are done correctly, and correct potential errors. · Ensure all incidents, good catches and near-miss events are reported in a timely manner. Assist with incident and near-miss investigations. · Minimum 5 years of Journeyman Lineman experience. · Working knowledge of state and federal OSHA laws and regulations. · Must be able to work outside and travel. · Ability to communicate effectively with various levels of staff and personality types. · Must be proficient in the use of a computer and be familiar with Word documents. · Desire and ability to learn the technical aspects of our industry. · May be expected to walk and maneuver difficult terrain on job sites. · Must have a valid state driver’s license. Competitive salary and excellent benefits package including employer paid medical, dental, vision. Utility Construction Company has immediate opening for a team oriented General Foreman/Superintendent willing to travel as needed in the US with a solid background and work history in Underground Transmission. This position will be responsible for overseeing day to day operations of crew(s) on underground transmission construction projects and will work closely with project management staff based in the office. Responsibilities also include estimating and handling paperwork associated with the crew and project. Must be able to pass post-offer, and random drug screening tests. Salary is commensurate to experience and qualifications. Excellent benefits package including employer paid medical, dental, vision, 401(k), personal time off and holiday pay. Wilson Construction Company has openings for team oriented General Foremen/Superintendents with a solid background and work history in Electrical Overhead Transmission/ Distribution projects. The General Foreman/Superintendent will be responsible for overseeing day to day operations of crew(s) on transmission utility line construction projects and will work closely with project management staff in the field and headquarters office. General Foreman/Superintendent Responsibilities also include the processing of paperwork associated with the crew, customer, and project. Wilson Construction Company has openings for team oriented Foremen with a solid background and work history in Electrical Overhead Transmission/Distribution projects. The Foreman will be responsible for overseeing day to day operations of crew(s) on transmission utility line construction projects and will work closely with project management staff in the field and headquarters office. Foreman Responsibilities also include the processing of paperwork associated with the crew, customer, and project. Oiler wanted to perform lube service on various heavy equipment and trucks for electrical utility construction company in Woodburn, OR. This position will support our headquarter, regional, and field offices. Must be willing and able to spend several weeks on the road and away from home. Ideal candidates will be self-motivated to learn about our company and equipment, take ownership in their position, and be able to think outside the box. Must be able to climb on, off, and under various pieces of equipment, and physically access all parts of equipment to perform job requirements. Hourly wage plus OT and per diem while traveling. Excellent benefits package including employer paid medical, dental, vision, 401(k), personal time off and holiday pay. Wilson Construction Co. has immediate openings for highly qualified Heavy Duty Mechanics, wanted for repair of various utility equipment and trucks for electrical utility construction company located in Woodburn. Wilson Construction has been in business since 1952 as a Power Utility Contractor working in multiple states throughout the US. Our mechanics are responsible for a large variety of repair and custom fabrication projects to support our headquarter, regional, and field offices. Wilson Construction Company has openings for team oriented General Foremen/Superintendents with a solid background and work history in Substation projects. The General Foreman/Superintendent will be responsible for overseeing day to day operations of crew(s) on Substation construction projects and will work closely with project management staff in the field and headquarters office. General Foreman/Superintendent Responsibilities also include the processing of paperwork associated with the crew, customer, and project. · Must be able to pass post-offer, and random drug screening tests. We are a well-established, privately-owned company in business since 1952. Visit our website at www.wilsonconst.com for more information about our company.